From Douglas fir and western redcedar in the lowlands, to Noble fir and Engelmann spruce at higher elevations, forests and groves cover half of the Evergreen State and provide its nickname. 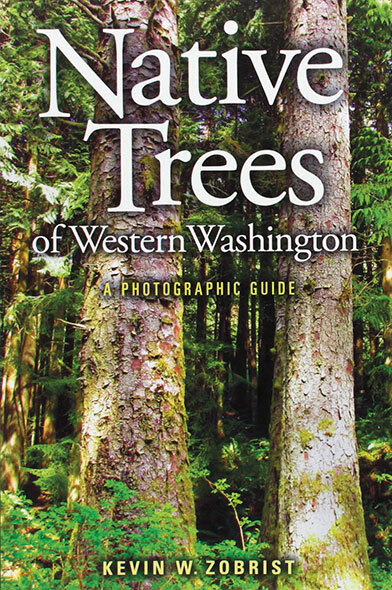 A new photographic guide for enthusiasts and explorers examines the native species of western Washington. Its author, Kevin Zobrist, is a Washington State University associate professor and regional forestry expert for WSU Extension in the north Puget Sound counties. The guide covers far more than evergreens. Native Trees of Western Washington also introduces broad-leaved deciduous trees such as Pacific madrone and bitter cherry. Each entry includes key features of the trees, range and habitat, modern and traditional Native American uses, and beautiful photographs of full trees and their details. Zobrist, a native of western Washington himself, brings to bear his considerable knowledge of individual species as well as tree physiology, ecology, and the dynamics of forest stands. The book, published by WSU Press, is available now. Help Zobrist find two elusive tree species—golden chinkapin and white alder—growing naturally in western Washington. Check out the Tree Hunt page at wsupress.wsu.edu/WSUTreeHunt and start hunting. If you spot these most-wanted trees, simply upload photographs and GPS coordinates tagged #WSUTreeHunt.